With the help of volunteers and several homeless charities the Capuchin Day Centre stayed open for the duration of the storm and offered extra 120 beds for rough sleepers. Br Kevin Crowley has criticised the government for failing to plan adequately for homeless people in advance of Storm Ophelia. With the help of volunteers and several homeless charities the Capuchin Day Centre stayed open for the duration of the storm and offered extra 120 beds for rough sleepers. The Dublin Region Housing Executive (DRHE) provided sleeping bags to facilitate this. However Minister for Housing, Eoghan Murphy, rejected the criticism, which also came from other NGOs and politicians. In a statement issued on the day of the storm (16th October 2017), he thanked Local Authorities, Dublin City Council, the Dublin Regional Homeless Executive (DRHE), and “all the voluntary organisations, who worked tirelessly over the last number of days, and especially throughout today (16th October), to ensure that all homeless persons had the option of shelter during Storm Ophelia.” He also thanked citizens who helped direct and get those sleeping rough into safe, secure shelter. DRHE explained that all the main service providers would keep accommodation open for the 24 hour storm period, including communal spaces for supplementary shelter. Its emergency placement service remained open to provide information and assistance and the Freephone service opened early. -additional shelter and 24 hour cafés etc by the Peter McVerry Trust and Focus Ireland, Merchants Quay, and Crosscare and others. – Dublin Simon Community’s extra beds and 24 hour opening as well as an extra outreach team. -Novas additional temporary emergency spaces. -Dublin City Council’s additional overflow facility at a sports complex in Marrowbone Lane, managed by the Peter McVerry Trust. -a DRHE funded outreach team (Focus Ireland and Peter McVerry Trust) to engage with those at risk of rough sleeping and offer them shelter. The Peter McVerry Trust stated that 368 people were placed in emergency accommodation. Other NGOs, and Catholic and other church and religious organisations also offered shelter. The Islamic Cultural Centre of Ireland, Dublin, issued a statement that it was opening its doors to “neighbours in need” during hurricane Ophelia and its large events hall was opened to the homeless for 24 hours with hot tea, coffee, and snacks provided. As well as working in Dublin, Focus Ireland also worked in Cork, Sligo, Waterford and Limerick, where staff were in regular contact with relevant local authorities to ensure resources were coordinated, and that no-one was put at risk during the potentially life-threatening storm. 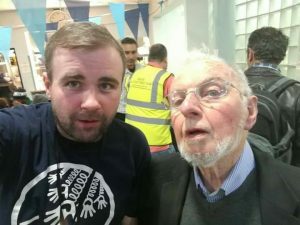 The Peter McVerry Trust also offered services outside of Dublin, in particular in Kildare through its Newbridge service and Athy Family Hub which were designated safe spaces for rough sleepers in the county. The organisation also coordinated efforts with local groups at Kildare County Council.